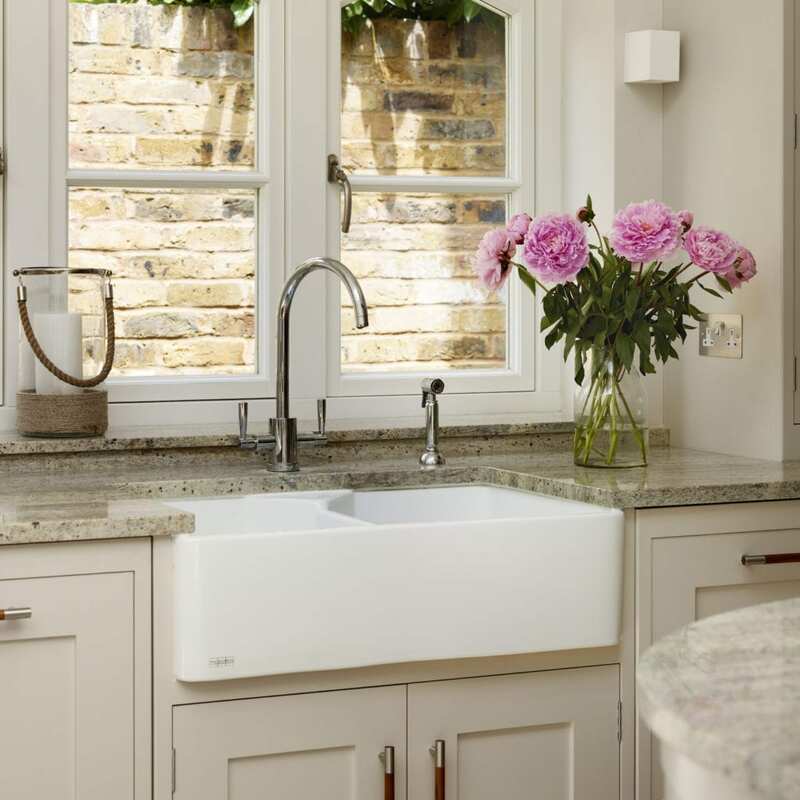 Having landscaped their back garden Jennifer and Jim decided now was the time to update the kitchen in their South West London home. Originally the kitchen was in the front of the property, but having redesigned the garden they decided to completely change the layout of their home so that the kitchen looked out over the garden. “We decided to move it to the rear, replacing a rather tired conservatory with an extension, so that we could make one large, light-filled room with beautiful views over the garden” said Jennifer. After seeing a Davonport kitchen in The Essential Kitchen Bathroom Bedroom magazine they knew that the Davonport Kensington range was perfect for their plans. 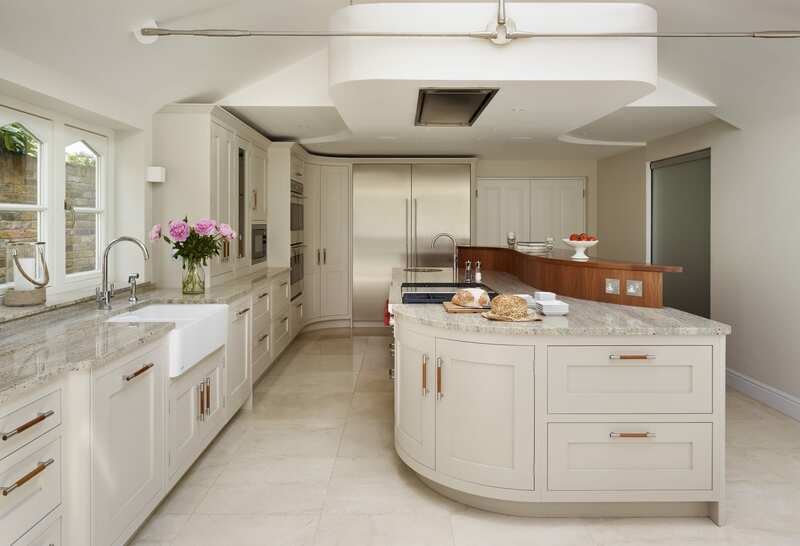 As only the third owners of their Victorian home, Jennifer and Jim were keen to modernise the kitchen, whilst simultaneously ensuring that the design was sympathetic to the building’s history. The blend of classic wooden painted furniture and modern mixes of materials provided the perfect balance between classic and contemporary. Jennifer is originally from Ireland and Jim from America. With family coming to stay and four grown up children of their own, Jennifer and Jim needed the kitchen to be a space big enough to entertain large numbers. “We love entertaining, so we wanted to create a space for a couple of people to be cooking together while someone serves drinks and others are at the dining table” said Jim. 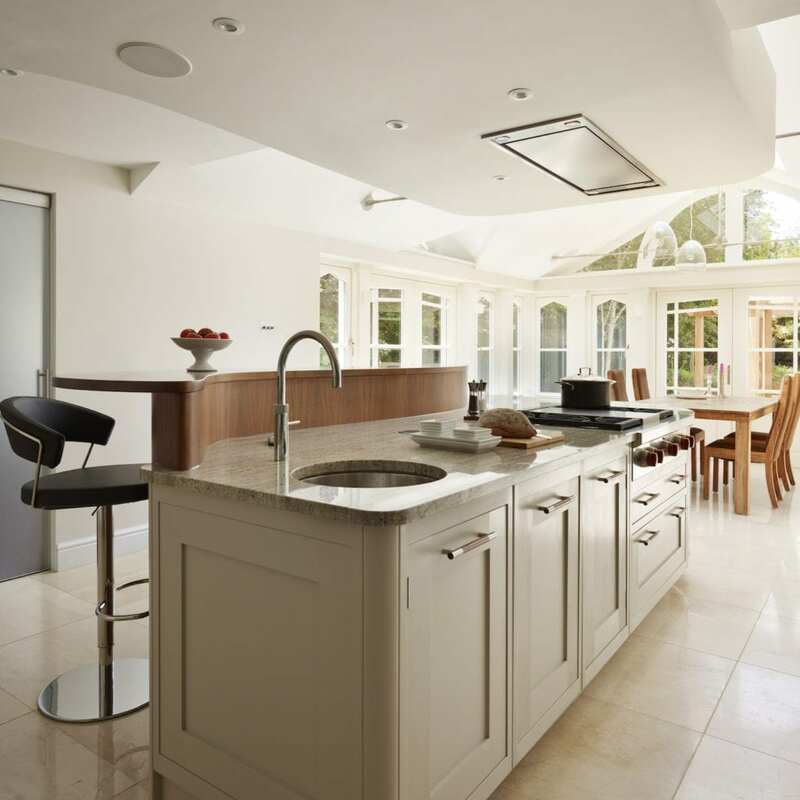 The open plan room houses the kitchen and the dining area with doors onto the garden. Immediately beyond the doors is a sheltered outdoor kitchen. The way the room flows enables people to be in the same place easily, whilst doing different things. It means that entertaining for large numbers is now a relaxing experience, with the added bonus of being able to appreciate the garden in all seasons. 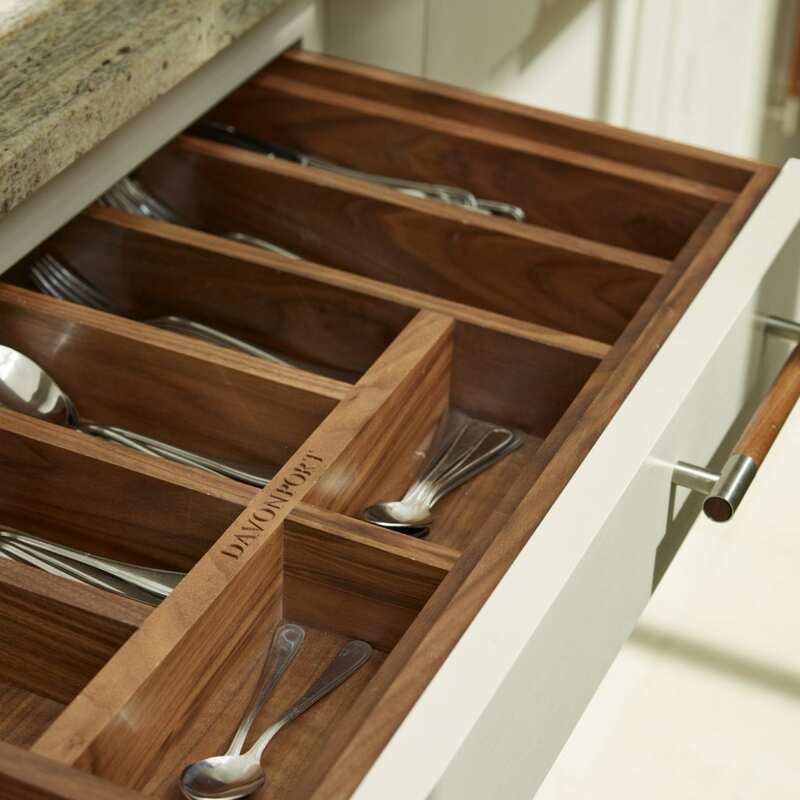 To provide enough storage, cabinetry sweeps around two of the walls. This includes a large larder, housing for built-in appliances, a drinks station and a TV area by the dining table. The Wolf rangetop features four dual-stacked sealed gas burners and a griddle/teppan yaki plate. Alongside this are the Wolf oven, Gagganau fridge and freezer, Miele microwave and dishwasher and Quooker Fusion Round tap which generates boiling, hot and cold water from one tap. The generously sized drinks area was designed so it would be perfect for entertaining. 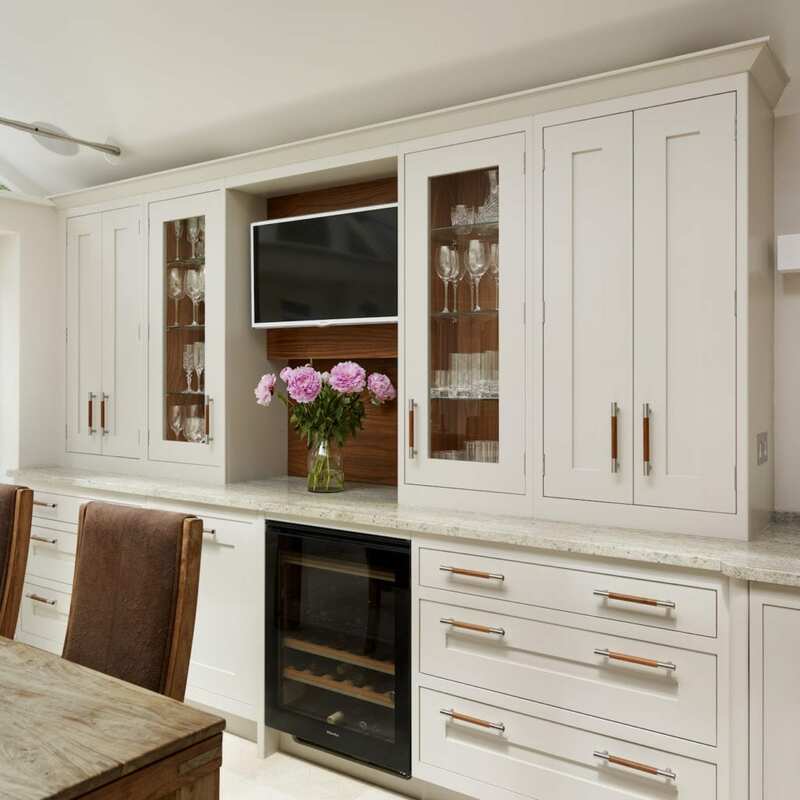 With a Miele wine cooler, pull out under counter fridge and a walnut-lined glazed cupboard for glassware, the drinks area is a prime example of how a space can be both beautiful and functional. 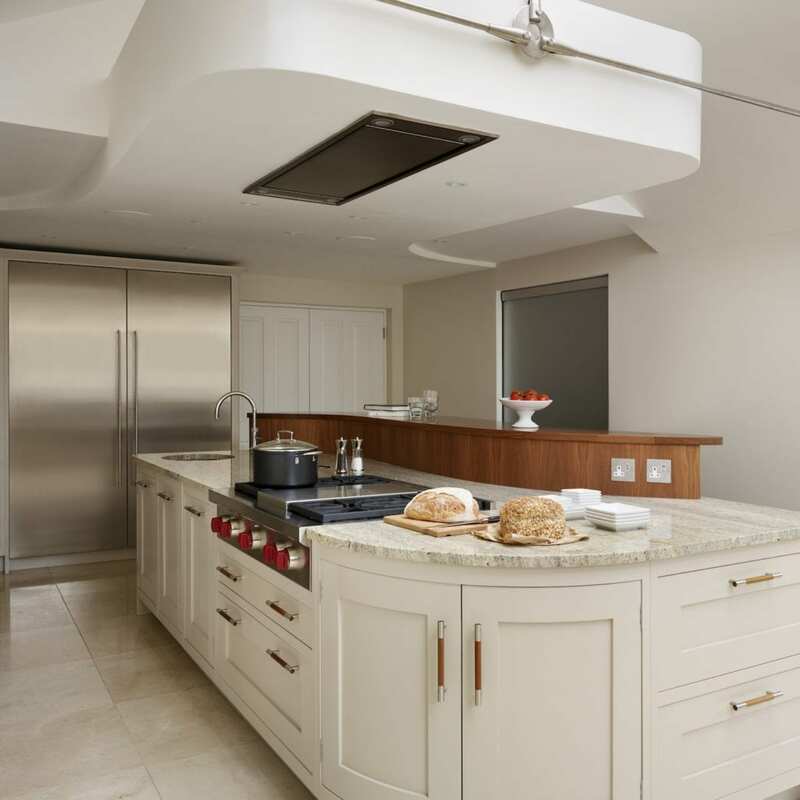 These appliances help to make the kitchen contemporary, as Jennifer and Jim requested this, while the finishing touches across the cabinetry are sympathetic to the history of the building. 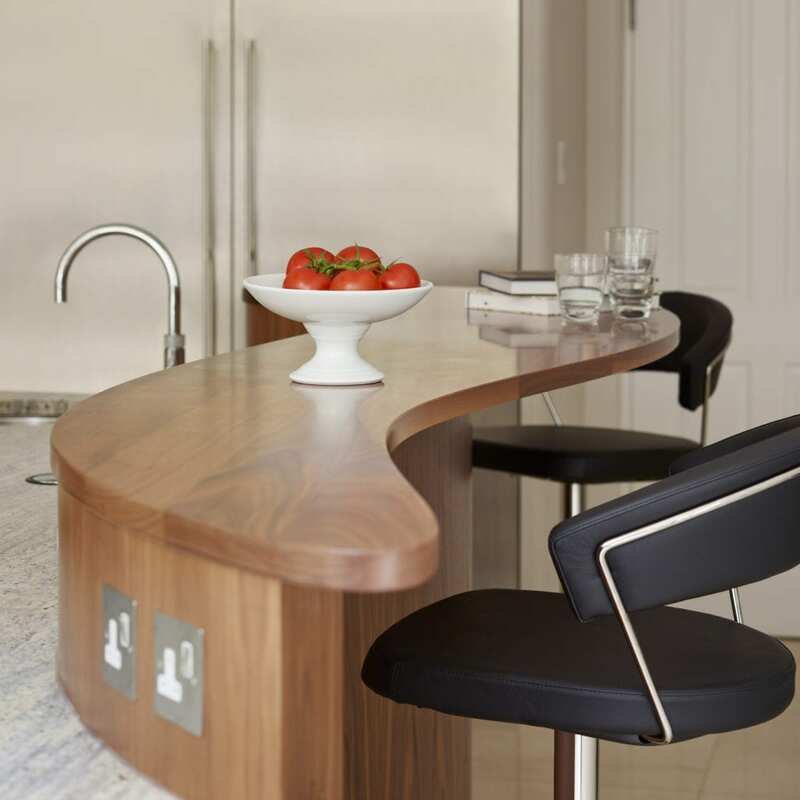 The focal point of the room is a stunning walnut curved breakfast bar. 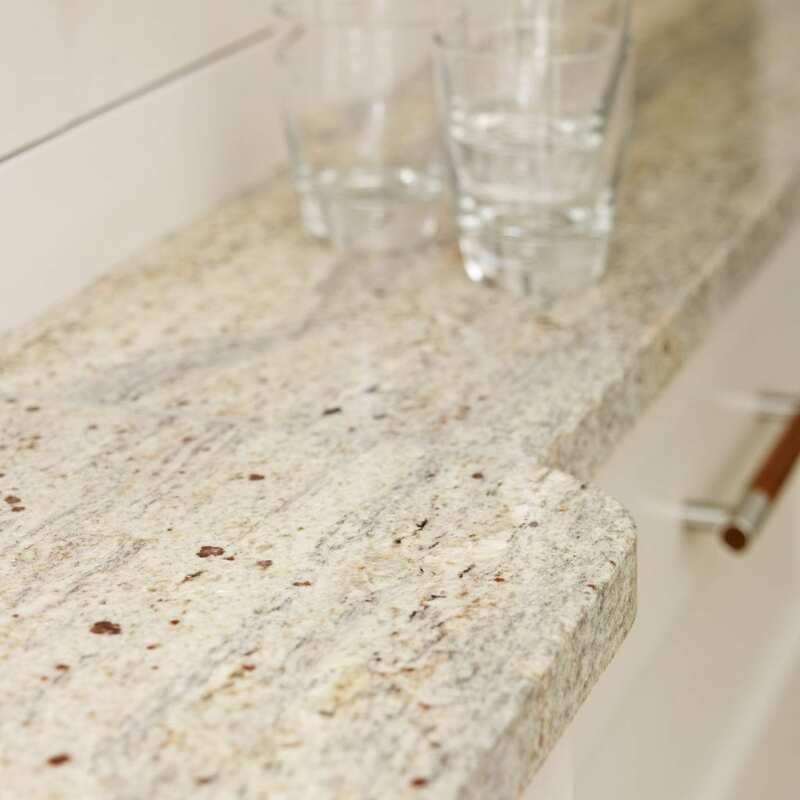 “As you enter the room, the bar is high enough to conceal the sink and prep area but most importantly, the beautiful walnut wave creates an instant wow factor” explained Jennifer. The curve of the bar was echoed in the ceiling feature, built to house the flush-fitted Westin extractor. Replicating style elements throughout the room ensures that it comes together as a whole. To complement the warm walnut tones and incorporating the brushed steel cabinet handles, the cabinetry was painted in soft greys; Liberty Slate III and IV. 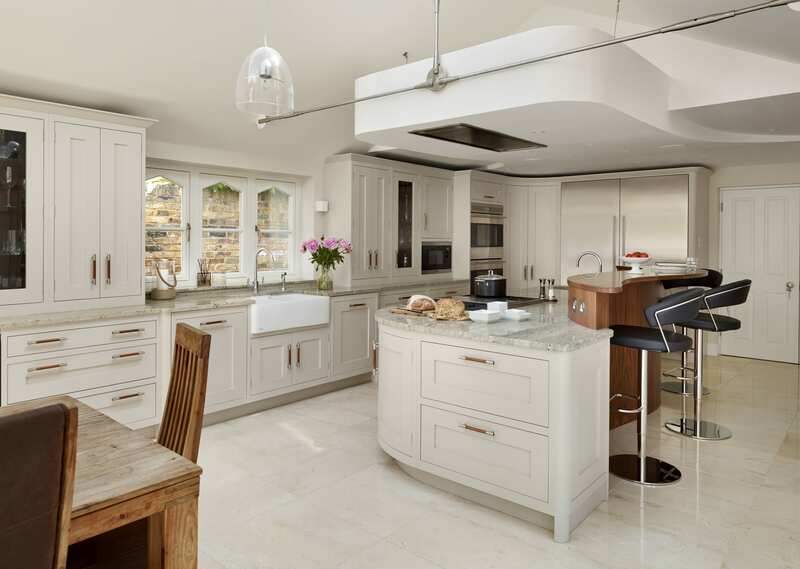 Teamed with Kashmir White granite worktops, the room remains a light and airy space. 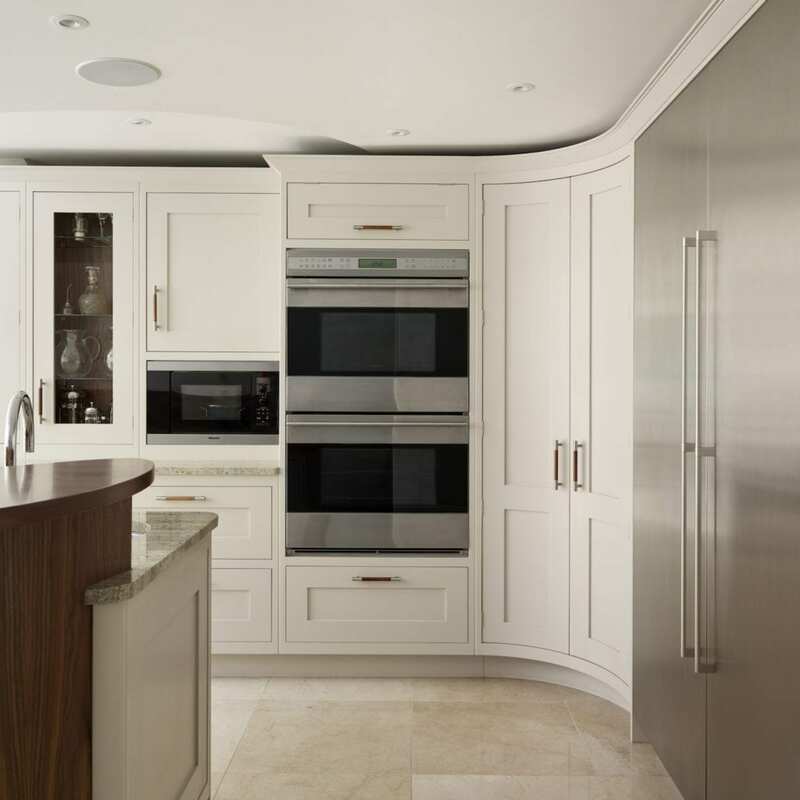 The overall effect, with the top of the range appliances and carefully selected cabinetry style and decor, means the room has a classic yet contemporary style. Jennifer and Jim now have a space that not only looks beautiful, but makes their dream of accommodating all their family and friends a reality, whilst enabling them to look out on to their newly landscaped garden.